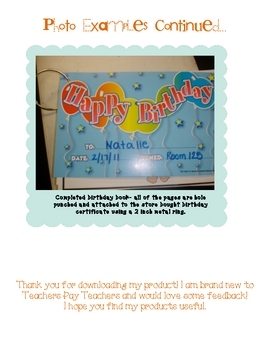 Do you want to jazz up those birthday certificates you can buy at the teacher store? 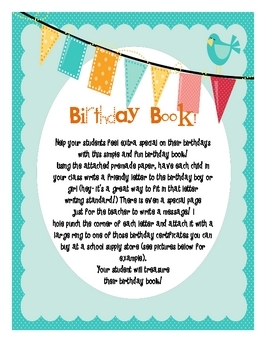 Use them to create a birthday book for your students! Help your students feel extra special on their birthdays with this simple and fun birthday book! 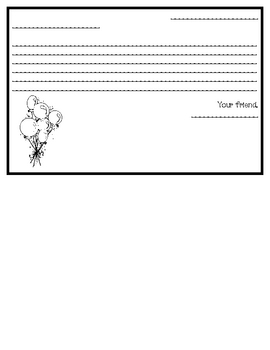 Your students will write the birthday boy or girl a friendly letter on the pre-made writing paper that is included in this download. There is even a special page for the teacher to write a message. Hole punch the corner of each page and attach it with a large ring to a birthday certificate (the certificate will serve as the cover of the birthday book). Your students will treasure their book!